The Magnificent Seven (film, 2016). A 2016 American western action film with "PG-13" rating by Metro-Goldwyn-Mayer and Columbia Pictures. Directed by Antoine Fuqua. Official Trailer. The Magnificent Seven is a 2016 American western action film directed by Antoine Fuqua. 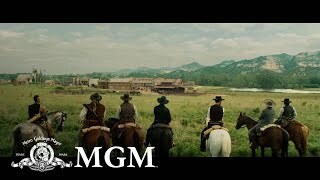 The Magnificent Seven (2016) | Official Trailer 2 . In 1879, robber baron and gold-mining tycoon Bartholomew Bogue assumes control of the American frontier town of Rose Creek, and subjects its residents to forced labor in his mines. After a town church assembly denounces him, Bogue has the church torched and kills a group of rebellious locals led by Matthew Cullen. Matthew's widow, Emma Cullen, and her friend Teddy Q. ride in search of bounty hunters to help liberate the town. They recruit Sam Chisolm, an African-American U.S. Marshal, who only expresses interest after hearing of Bogue's involvement. Principal photography on the film lasted 64 days, from May 18 to August 18, 2015, in the north of Baton Rouge, Louisiana. The film The Magnificent Seven was scheduled to be released by Metro-Goldwyn-Mayer and Columbia Pictures on September 8, 2016 (TIFF), on September 22, 2016 (Germany) and on September 23, 2016 (United States). The duration of the film is 133 minutes. With a budget of $90 - 107 million, the film grossed over $162.4 million. The Magnificent Seven got high rating from critics. The audience also likes the film. Audiences polled by CinemaScore gave the film an average grade of "A-" on a scale ranging from A+ to F.